I recently came across an interesting blog developed by Peter Friedman and the students in his Legal Analysis & Writing classes at Case Western Reserve University of Law during the spring 2008 semester. The posts navigate the tricky waters of Fair Use and artistic license to parody, incorporate and generally use existing material in a new and original manner. As a graphic designer, I often incorporate snippets of existing images into digital collages for personal and commercial work. Is this theft? 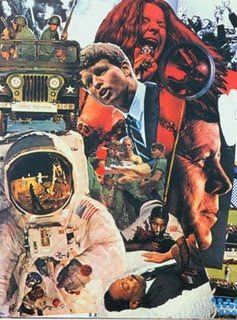 The image used as an example in this discussion is a collage by Robert Rauschenberg that combines (possibly copyrighted?) partial images to make an artistic statement about the political and social turmoil of the 1960's (on right). The blogger says, "Artists who routinely appropriate, on the other hand, are not attempting to profit from the marketability of their subjects at all. They are using elements, fragments, or pieces of someone else's created artifact in the creation of a new one for artistic reasons. These elements may remain identifiable, or they may be transformed to varying degrees as they are incorporated into the new creation, where there may be many other fragments all in a new context, forming a new 'whole'. This becomes a new 'original', neither reminiscent of nor competitive with any of the many 'originals' it may draw from. This is also a brief description of collage techniques which have developed throughout this century, and which are universally celebrated as artistically valid, socially aware, and conceptually stimulating to all, it seems, except perhaps those who are 'borrowed' from. " It seems that this could be taken further, perhaps past the realm of two-dimensional collage to multimedia productions of various kinds which use parts of existing video, music or still photography in combination as part of an "original" project. I don't know how I'd feel if my own work were borrowed and transformed - it's an interesting question, and one that probably produces more controversy that it does answers. it truly is a fine line with what is borrowed and what is stolen. with things being posted and used on the internet that line becomes much thinner.